Microsoft delivered a Windows Store design refresh on Tuesday—one focused on improving app discoverability. The new store update puts more featured apps front and center and makes it easier to navigate to the Store's top lists by placing a persistent navigation bar right at the top of the screen. But the new update is about more than just improving the Windows Store's much criticized app discovery chops. It's also an implicit admission that the old design that focused on text links and a lot of horizontal scrolling to get to the good stuff just wasn't working. 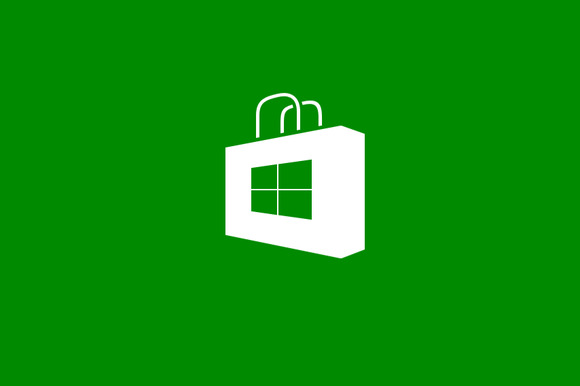 Microsoft claimed the Windows Store was "designed for discovery," after all, when the Windows Store came out as part of the Windows 8 beta back in 2011. "Ensuring the visibility of apps and the efficiency and fluidity of app discovery became the fundamental building block of our Store design," Microsoft said at the time. Sure, the Windows Store has evolved in design over the past three years, but those basic text-centric elements remained the building blocks of the Windows Store—until now. 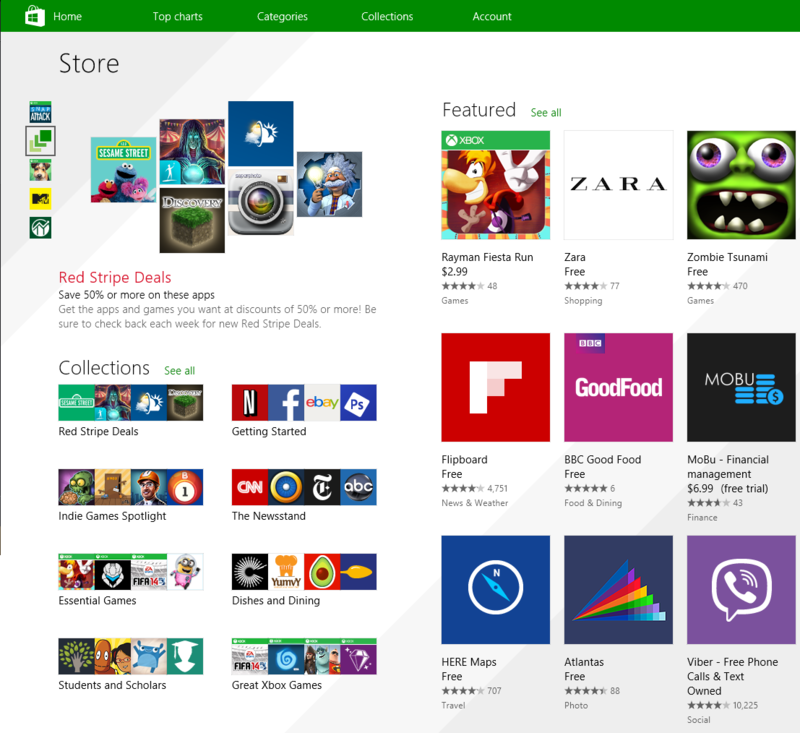 Here's a look at the new Windows Store. The persistent navigation bar makes the new Windows Store feel more like a desktop app. The most obvious change to the Windows Store is the new navigation bar at the top of the screen, with options for Home, Top charts, Categories, Collections, and Account. The new Home button is a particularly welcome sight. Under the old design, the most obvious way to return to the store's landing page was to jam on the back button over and over and over again. It wasn't the only way to get back to the beginning, but it was by far the most obvious. Tapping the top charts, collections, or account options brings up a drop-down menu that lets you navigate deeper into the store with just one click. But Microsoft decided to break this design convention with the Collections button. Instead of seeing a drop down menu for collections, you're shunted to a separate page within the store. Collections are thematically grouped apps that have been curated by the Windows Store team. Currently, you'll find collections for social networking, sports, Xbox games, utilities, news apps, and apps currently on sale. There's also a "getting started" collection that includes a bunch of popular apps most users would probably like to install such as Adobe Photoshop Express, Facebook, Hulu Plus, Netflix, Skype, and Twitter. A handful of collections are also spotlighted on the Windows Store home page. One collection you won't find, however, are personalized recommendations. Those are under Top charts > Picks for you. With the new Store update, Microsoft has also brought back the Spotlight section for featured apps and renamed it—you guessed it—Featured. This is one of the first sections you'll see on the Store's landing page. But the landing page is one of the few places you'll see the Featured section, since it's not part of the Top charts, Categories, or Collections menu options. Microsoft says you'll also see featured apps on category pages, but as of this writing featured apps were only present on the landing page and the games category page. Microsoft is also adding comparison pricing for sale apps, where you can see the original price with a red strike-through next to the sale price. This feature is not yet active, but will be rolling out to the updated Windows Store over the next few days. Buy once, download anywhere universal apps now available in the Windows Store. We spotted Halo: Spartan Assault functioning as a get once, download everywhere app on the Windows Phone Store in April. But on Tuesday, Microsoft highlighted this category of apps once again and included them in the Windows Store refresh. These types of apps give developers the option of linking their Windows and Windows Phone apps. That way you can pay for an app once (including in-app purchases) on one Windows platform and download it for free on the other. 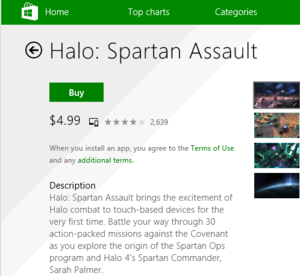 You can tell when an app is using the buy once, download anywhere option when it has a tablet and phone icon on the app's description page, as shown next to the purchase price of Halo: Spartan Assault above. The new Windows Store update is rolling out now via Windows Update as part of Microsoft's regular Patch Tuesday security and new feature releases. If you haven't received the update yet, you can force the download by running Windows Update.